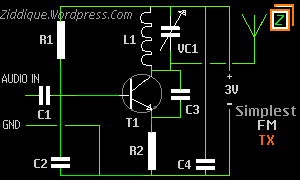 This is a simplest FM transmitter circuit i built so far, for educational purposes. many “simple transmitters” (Most transmitters on internet claim to be simple but many of them don’t work) on internet will not work as those circuits are designed poorly. L1 – Aircore inductor, 6turns on a 3mm dia former eg.Wind over a pen refill. After building is done,power the circuit using a 3V battery and connect any audio source to “audio input” pin properly, set an fm radio minimum 3 meters away. Start tuning the radio and tuning the VC1 at the same time untill you receive the transmitting audio, if you can hear the audio then you are DONE!. If the transmitting audio is too loud and unclear, then add a 100K or 1 Mega ohm resistor across the audio input pin, the value of this resistor depends on how much powerful you audio signal is and should be selected untill you get a very clear voice.